So today was the first day that public-facing elements of the convention, in the form of Registation, opened, while those of us working MIMO (Move In/Move Out) functions were all over the convention center dealing with our myriad jobs. Me, I got to be a middle manager. That is, I had to work with the area heads below me, the chair above me, and other division managers adjacent to me, to deal with some matters that came up and needed to be resolved. Some of them were challenging, and at times nerves were a bit frazzled, but I think we got it done. Back in 2002, this equivalent day saw me and Lisa hauling the makings of Hugo Award trophies up to the third floor (no elevators) of the Civic Auditorium, where Lisa ended up stuck in a hot, stuffy room assembling Hugo Award trophies and unable to leave because I'd forgotten to tell her that the Events office down the hall had the key to lock up the secure storeroom. Things were much better this time around. The Hugo Awards Ceremony will be in the new Grand Ballroom of the convention center (not across the street in what is now know as the City National Civic Auditorium.) There is a secure office (in an air-conditioned area) where Hugo Administrator Dave McCarty had the makings of both the 2018 and 1943 Hugo Awards and was assembling them. Lisa volunteered to help, and her help was gladly accepted. So she got to do almost exactly the same job as 16 years ago, including fun stuff like using a tap-and-die set to chase out the threads of balky Hugo rockets. 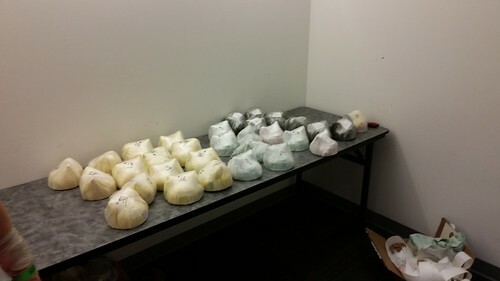 Here you see the larval forms of the Hugo Award trophies while we waited for them to hatch. Y'all will get to see more of them tomorrow, as the final forms will be revealed during the convention's opening ceremonies, after which the display copies will go into the Exhibits area. In order to deal with one particular item that needed my own boss to resolve it, I had to go into the Exhibit hall, where he can been working on the San Jose Light Tower. Here's the fully-assembled tower in the main hall, while more exhibits were going up around it. Around 2 PM I was seriously starting to fade out, having not eaten since I had a cup of instant oatmeal for breakfast in the hotel room around 8 AM. Lisa and I went for lunch at the Indian restaurant across from the Fairmont. Unfortunately, even their mild meal was too hot and spicy for Lisa. Fortunately, she later met up with Scott Sanford (who arrived today by train) and they were able to get dinner while I was engaged with my other responsibilities. Turning to another one of the areas in my division, Site Selection had a required function that had to be done today. 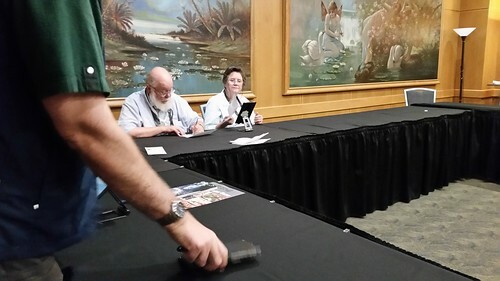 Representatives of the bids (both for the 2019 NASFiC and 2020 Worldcon) gathered in a Sekrit Location (mainly because the room isn't on the convention's floor plan, so we had to sort of guide them in) to validate the site selection ballots cast by paper and electronic mail. Kent Bloom, seen here at left as the last few advance ballots were validated, was one of those who were with me during the infamous Fourteen Hour Ballot Count of 1991, where it took all night to get everything counted mainly because voters' names weren't being checked off as they voted during the convention. In this case, the validation of advance ballots took less than an hour. Of course, all site selection races since 1991 have learned their lesson, and voters are being checked as they vote, not after the polls close, so the actual counting of ballots doesn't take very long. Back in 1991, the counting of the 2,107 ballots didn't actually take long; it was validating the eligibility of the voters to make sure we could count the ballots! Following the advance ballot validation, SFSFC, parent corporation of Worldcon 76, had a brief board of directors meeting, called by arrangement during our last regular meeting. While we don't expect to need it, the purpose of this meeting was to administratively allow the Board to be convened on very short notice by the Chair (without the normal notice requirements) in case of an emergency. We did this in 1993 and 2002, and the President didn't have to call that meeting, but it's reassuring to have the ability to do so if necessary. Having had lunch so late, I wasn't that hungry, so after the Board meeting, I wandered over to the Fairmont and briefly dropped in on the only party I knew of on this Twas-the-night-before-Worldcon: The Boston in Christmas 2020 party. I did not stay long, however, and even leaving early to head back to the Hilton, I didn't get back until late, since I kept running into people with whom I wanted to talk. 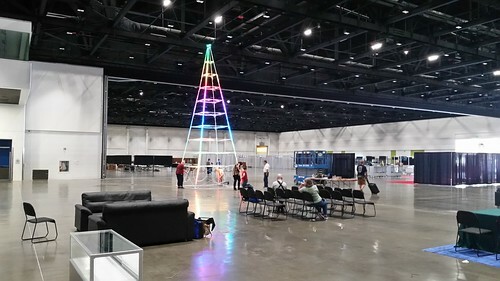 Worldcon Setup Day is generally really stressful, and this was no exception. I was reminded of how much I dislike being a middle manager, notwithstanding that I was the right person for this particular job. I'm really grateful that all of the people with whom I'm working both in the WSFS division and in the adjacent divisions and areas have been good about working through the process, even when we didn't all completely agree on the specific actions that needed to be taken. This convention is shaping up nicely, and I really am looking forward to the Worldcon opening for real tomorrow morning.